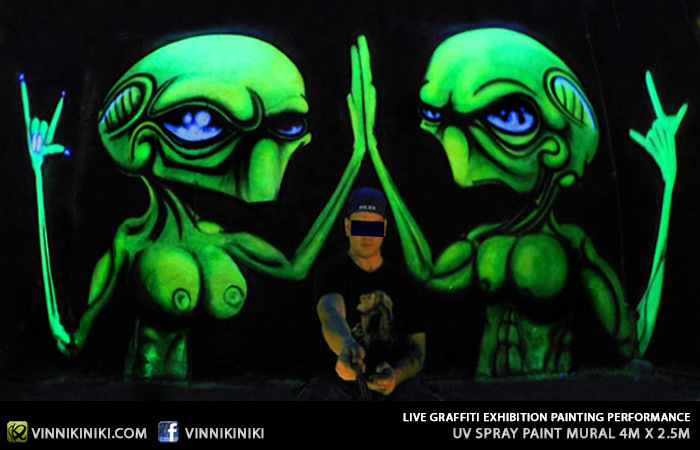 Black light alien graffiti mural I painted at the Thong Lor art space gallery in Bangkok. It was a pleasure to be invited to take part in the ‘Space Oh these Crazy Artists’ exhibition; a mix of different artistic disciplines & styles, art created by both Thai and international artists. 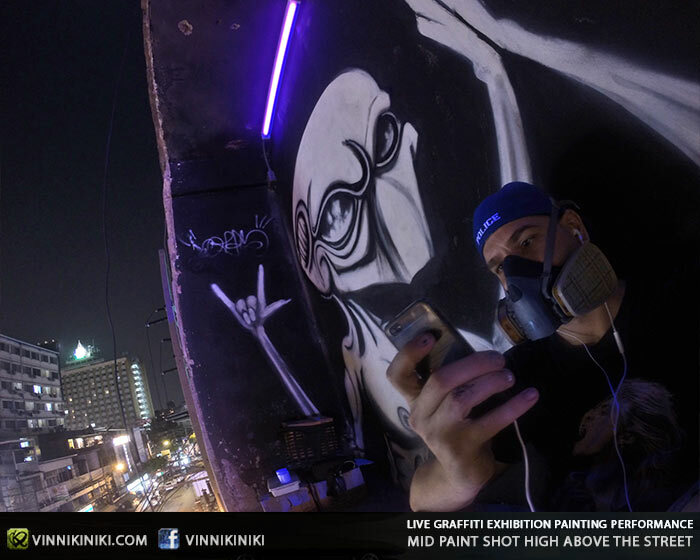 The premise was rather simple, give life with art to a recently re-purposed building in the heart of Bangkok’s central Thong Lor district & turn the activity into an exhibition event…which for me is an excuse to paint a nice black light alien art mural. The gallery itself is starting from the ground up, literally; the staff are working their way from the bottom of a 5 storey building renovating each space one floor at a time. The bottom floor is a fully functioning theatre & live performance art space, the ground floor being a café & bar with a performance stage for poets, musicians, spoken word artists & I even caught a mime act alongside a solo acoustic guitar performance act. The rest of the building however was pretty much an empty shell, no windows and only make shift cabling to get some lighting and electrics into the upper floors. The walls, concrete, empty & bare, well in need of some cool murals & graffiti art. As part of the 3 weekend long exhibition artists were invited to claim a space within the building to paint their murals or graffiti pieces. 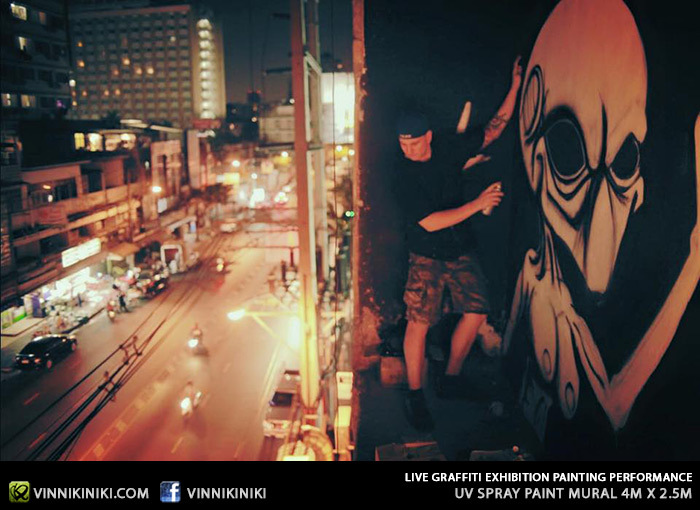 The premise of the art show was to invite people to view graffiti art & murals being created as a kind of live painting performance. The artists who were part of the show painted in various styles & themes and it was wonderful to meet them all. Lucky for me I spotted a great opportunity to paint on the outside of the actual building itself! The art piece is highly visible by people on the street level and even when traveling on the BTS skytrain. What’s more the art gallery staff purpose installed 3 sets of UV lights on the 3 panels I was painting to really make my piece come to life and pop out after dark. My proposal was inspired by the art galleries initial brief, use a triangle, circle or square space, in the end however I couldn’t decide on one shape so I greedily offered to paint all three, lucky for me the gallery staff accepted my proposal and I got to paint a thematically connected UV black light graffiti mural on 3 floors overlooking the busy street below. Below you can see the original digital art proposal I submitted to the gallery. 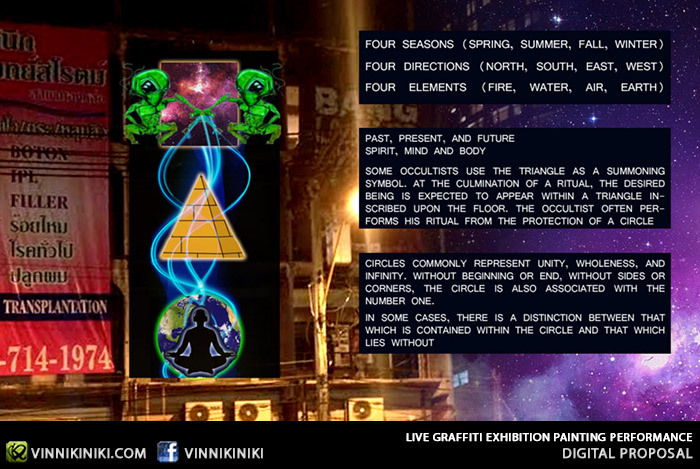 High fiving alien art, the Egyptian Illumanati & the world as a vampire: The Meaning? To be honest I’d be lying if there was a real meaning to this piece. However one can certainly draw their own conclusions, let me know what it means to you by dropping a comment below. I did have a rough idea/meaning to begin with but this was definitely a case of good aesthetics over deeper meanings; in other words I was concentrating on making art that looks good. Obviously you can draw some conspiracy theory type imagery and themes from the piece. The aliens are at the top of vertical food chain, did they create or inspire the Egyptian pyramids and indeed the Egyptian civilization? Are they watching over humankind all along? Did they manipulate ancient history of humans? Is the pyramid with an eyeball popping out wrapping around the body a reference to the all seeing eye of the Horus? What many people believe to be symbology used by illumanati to represent enslaving and population control through the brining about of a new world order? The world is a vampire… Originally it was going to have an image of a human meditating in front of it, but I figured I’ve already got and eye and a triangle I might as well do something interesting with the Earth. So again one can argue the positioning of the triangle above the earth represents the control of a global population by a select few powerful individuals, a pyramid scheme of sorts where the top level profits and the ones at the bottom are f@#ked over. I’m a strong believer in people power, so yeh, for sure sometimes we the many need to take a bite out of the few and show a bit of teeth, the other possible interpretation is the world is at breaking point and the vampire like fangs and smoke emanating from the mouth are representations of the Earths pain and suffering brought on by the destructive acts of humans. It’s also a lyric by Smashing Pumpkins… which i had mostly stuck in my head whilst painting the black light Earth. Actually to be completely honest, I love painting using UV black light reactive paint, aliens and occult symbology & mythology, and big teeth and fang demon type creatures. So to be blunt it’s just a bunch of things I like to paint, and I’m happy with the results. 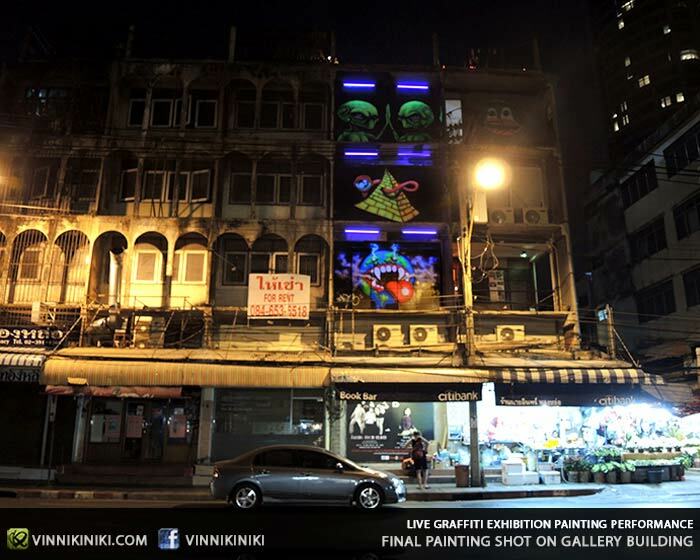 Certainly it’s a trip to see my art blinging in black light about a busy Bangkok street. Overall the exhibition was great and I got to meet a lot of nice people and got to exchange some tips with other artists, which is always a great thing about ‘jamming’ with other artists. Getting to watch people paint an art piece from start to finish can reveal a lot of cool painting tricks and secrets. I would highly recommend the Thong Lor Art space to anyone who has an interest in art, graffiti & murals but in particular performance art. Most of the staff at the art gallery are involved in performance art, so it’s a great place to visit if that is your bag. It was clear to see from the organisation and execution of the ‘Space Oh These Crazy Artists’ exhibition that there is some really interesting and exciting performance artists emerging from Bangkok, Thailand. Check out what’s going on at the art gallery space by visiting their Facebook page the link is below! If you made it reading all the way to the end I congratulate and thank you! 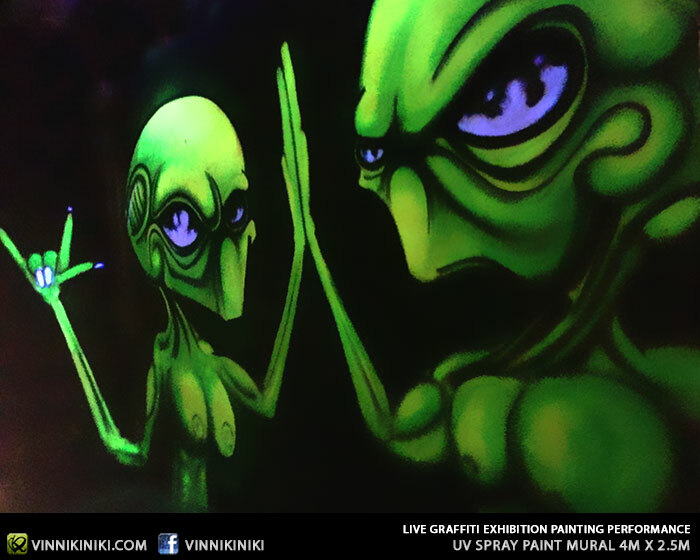 If you are interested to have uv black light alien art painted at your venue or would like to order a custom canvas please contact me.